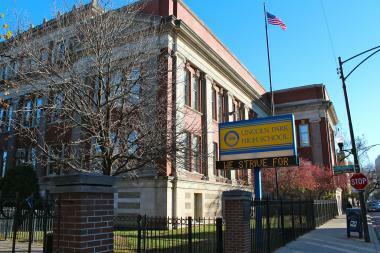 Lincoln Park High School is slated to get a $20 million renovation. LINCOLN PARK — Lincoln Park High School is getting air conditioning, a new drama workshop and a new coat of paint. Those were the items at the top of Principal Michael Boraz's wish list when he was joined by Mayor Rahm Emanuel on Saturday to announce a $20 million renovation for the school. "In case you missed it, shortly after the Cubbies ended their 108-year World Series championship drought, LPHS ended a drought as well," Boraz said in a letter to parents, students and the community. "I'd like to thank all the LP families for keeping their faith in LP, even while other schools with seemingly less need got renovations. You never doubted that our turn would come. LP is already one of the best schools in the city, state and country, and now we are going to be even better, with a building that will match the quality of our academic, arts, and extra curricular programs." "It got lost in the Cub craziness," said Shannon Waterfield, who has two kids at the high school, on Monday. "It's so long overdue," she added, "but we'll take it." The money, according to Ald. Michele Smith (43rd), comes out of the $250 million tax levy for capital improvements in Chicago Public Schools approved as part of the state budget compromise reached last summer. "Thanks to teachers, parents and the community, the renaissance of Lincoln Park High School continues," said Smith. "This major investment will bring a major computer-systems upgrade with a distance-learning lab, as well as a ... lab for drama and videography. Many other upgrades include a new music and weight room, plus air conditioning. "Over two summers LPHS will look dramatically different," Smith added. "It's all part of keeping a world-class high school in the neighborhood and retaining families in our ward and our city." The new weight room should benefit Lincoln Park's football team, coming off an 8-1 regular season and an appearance in the state playoffs. The weight room was previously on the second floor, and caused the floor to sag noticeably. "The work will be done over the next two summers, so there will be little to no disruption to use of the building during the school year," Boraz said. Air conditioning and the new music and weight rooms and drama workshop are expected to be done next summer, and the school will be repainted the following summer in 2018. Boraz tweeted triumphantly following Saturday's announcement. Mayor Rahm Emanuel and Ald. 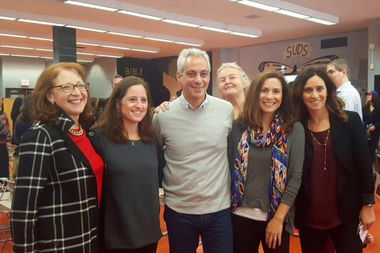 Michele Smith (left) are joined by Lincoln Park High School community members Cindy Schnoll, Nada Riley, Jennifer Fardy, and Amy Zemnick at Saturday's announcement.